Worry and anxiety can convert to migraines, tension headaches, irritable bowel through worry, fear and anxiety, chest pain and tightness with no medical cause, grief and maybe crying in sadness. Some people may reminisce on what they did and what they did not do, become angry and sad at the same time, relationships suffer and some become withdrawn and lonely. People can identify that when they are not feeling tip top they want to be on their own and not bother anyone. It is safe to say that some people do not want others to know they are in pain. Not everyone wants to talk about their pain either. Either way Private SHEN Sessions are the answer. Of course there is fear and understandably we are scared at first meeting with a SHEN therapist. If we look at emotional healing like it is more sensitive than any relationship with another human being. The relationship of inner emotional healing of the self can be a painful process so its imperative you have the help of a qualified and sensitive SHEN therapist. The process of raising and dissipating painful emotion with SHEN is far gentler than you might think. Some people may say “I’m afraid of what might come up” SHEN does not shock you into recall. What comes up you consciously know about and because the qi flows between the practitioner’s hands are always drawing the emotion out, the emotion that remains is always being reduced, so the pain is lessening all the time. If you recognise and acknowledge you need to go on the inner journey of healing and empowering change you have taken the first step. Rejuvenate session; you may want just one session to clear your head, clear surface stress and or you may want to experience the therapy to see if its for you €60. When you arrive for the first appointment there is a consultation process followed by one session. Time is not rushed with an allowance of two hours for each first time appointment. The session begins after you are invited to recline, fully clothed, on a special SHEN ‘cradle’, the therapist places a throw over you (not all therapist do this however you have the option to request a throw because when the body relaxes the temperature goes down, the throw also provides a boundary between you and the therapist which people report helps them feel safe to relax and focus on your session. As the session progresses you may feel heat you may feel cold, you may fall asleep you may not, you may feel tingling sensations you may not, you will be aware of the therapist moving their hand from one position to the next, you may hear the therapist coach you as you relax deeply or enter a meditation-like state; you may recall forgotten memories of pivotal events or people from earlier in life. You will likely feel the emotions related to these and to recent events, as they surface and leave, but in a way you can readily handle. It is important to remember you are in charge not the therapist and you can discontinue the session if you wish to do so, the therapist aim is your aim. It is not good to compare your experience of SHEN with that of others because we are different, no two people experience the same way or react the same way to same or similar events or situations in life. The number of sessions necessary varies from person to person; your practitioner can advise you on this. All SHEN practitioners have received extensive SHEN themselves and will be comfortable with any emotional material that may come up. 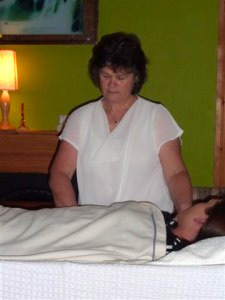 You can always call me Deirdre at deirdreleavy@eircom.net for a one to one treatment session. You may know someone in pain, be kind, please tell them to contact me. You can look forward to my continued support. Clinic open 8am to 8pm Monday to Saturday. Call anytime for inquiries and bookings for private sessions, workshops and training.